On 14th July 1551, fifteen year-old Henry Brandon, 2nd Duke of Suffolk, and his fourteen year-old brother, Charles, 3rd Duke of Suffolk, died of sweating sickness at the home of the Bishop of Lincoln in Buckden, Huntingdonshire. They were the sons of the late Charles Brandon, 1st Duke of Suffolk, and his fourth wife Catherine Willoughby, Baroness Willoughby de Eresby and Duchess of Suffolk. 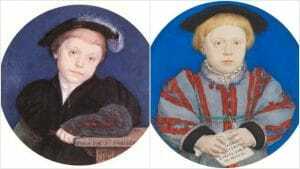 Picture: Miniatures of Henry Brandon, 2nd Duke of Suffolk, and Charles Brandon, 3rd Duke of Suffolk, by Hans Holbein the Younger. Very sad indeed, but I wouldn’t call their family one of power. Charles Brandon’s father was a standard bearer (and a knight I assume as he is Sir William Brandon) he died at Bosworth Field. Charles was then taken into the royal household and raised as a playmate of the Royal children. Without their relationship Brandon would not have been elevated to his position, it wasn’t inherited and wasn’t from a hereditary connection. Catherine was the daughter of a hereditary earl, but with the death of her sons came the end of that line, her titles passed on to the Bertie family. All of their power came from the crown, exampled by Catherine going into exile in the Marian persecutions (as did many others, but the point is that the family wasn’t the power, the crown was the power and they only had the power while in favor of the crown). Sorry, Bertie was her second husband, which caused quite a scandal, the title didn’t pass into a different family. Do we know what the “sweating sickness” actually was? Nobody knows what it was and why some people got it mildly and others died, it’s a real mystery. If you go to https://www.theanneboleynfiles.com/14-july-1551-the-brandon-boys-die-of-sweating-sickness/ there’s a video “What was sweating sickness?” at the bottom of the article.